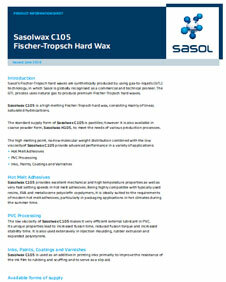 Sasolwax C105 is a high melting, fully hydrogenated Fischer-Tropsch hard wax, consisting mainly of linear, saturated hydrocarbons. The high melting point, narrow molecular weight distribution combined with the low viscosity of Sasolwax C105 provide advanced performance in hot-melt adhesives. 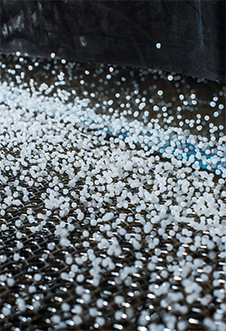 Being highly compatible with typically used resins, EVA and metallocene polyolefin copolymers, it is ideally suited to the requirements of modern hot-melt adhesives, particularly in packaging applications in hot climates during the summer time. 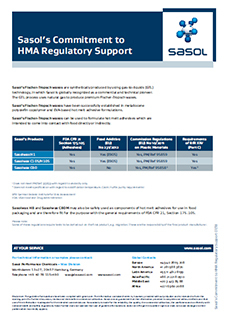 Sasolwax C105 complies with the following regulations: FDA CFR 21, Commission Regulation (EU) No 10/2011 (Ref. 95858), Recommendation of the BfR (German Federal Institute for Risk Assessment) XXV, Part C.